Turns out the Switch's diminished power isn't the biggest hurdle that needs to be cleared. Yesterday, we learned ARK: Survival Evolved is coming to the Nintendo Switch. The next question was "How?" The Nintendo Switch isn't exactly helpless to produce current-gen graphics, but neither does its processing power match up to the PlayStation 4 and Xbox One. Right? Not quite, according to Abstraction Games. The big challenge with Switch ports isn't the system's power—it's the limited size of its cartridges. 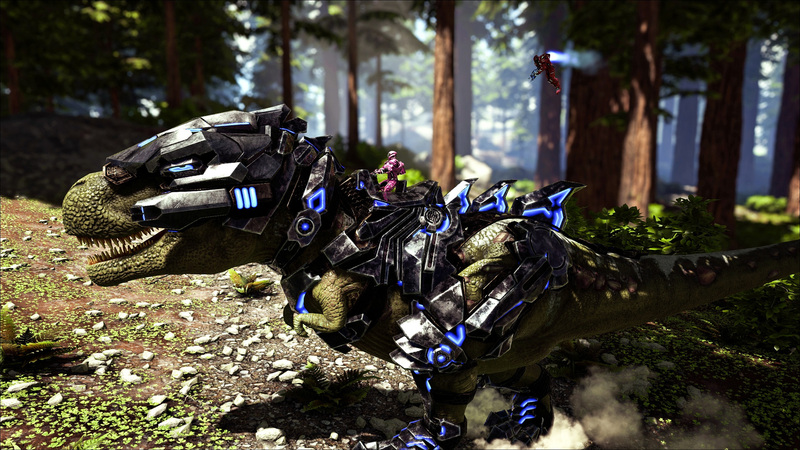 Abstraction, a Netherlands-based studio that specializes in ports, is handling the Switch port of Ark. Its CEO, Ralph Egas, shared some insight into the process with Gamesindustry.biz yesterday. Yes, the Switch isn't quite on par with the PlayStation 4 and Xbox One, but its performance potential isn't as underwhelming as people think. "In some locations you need to downsize a bit on the distance you're able to view. But not as much as you'd think compared with Xbox One and PS4," Egas says. "Obviously, in terms of Xbox One X and PS4 Pro, that's a different story. But compared with the base platforms, Switch is not that bad." This ancient prehistoric killer needs more guns. More guns! It turns out the real trick is getting everything onto the Switch's wee carts. "The 32GB carts are expensive, you shouldn't be wanting to do that," Egas says. "So we need to fit everything on 16GB, whereas the standard game on PS4 is much, much larger. It's a crazy ratio we're talking about. However, thankfully, there are a lot of opportunities for reduction without changing anything anyone will notice." Some of those changes might involve "having fewer dinos here or there, and downsizing on actual content experience. But that's only a bit. The rest is just from clever compression algorithms." Egas also says staggered downloads will help compensate for the Switch's small cartridge space. The rest of the interview indicates the Switch port of ARK is going smoothly and it should be ready in time for its Fall 2018 release date. Ark's already been adapted for mobile platforms, so hopefully Nintendo's console / handheld hybrid proves to be a good home for it. Personally, I'm jazzed for ARK's Minecraft-inspired spin-off, PixARK. Tagged with News,	Nintendo Switch.